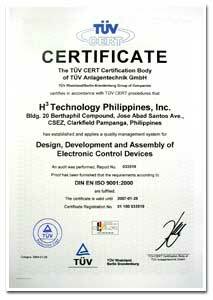 TUV Rheinland, an internationally recognized third-party assessor, has certified H3 Technology Philippines, Inc. with ISO 9001 and ISO 14001 on December 18, 2003. The certification was granted just barely after a year of inaugurating the Philippines operations. In spite of being a relatively small company, H3 Technology has established long-lasting partnerships with its world-renowned customers. This only shows that the company is dependable in terms of quality, delivery, pricing and in overall total customer satisfaction.